Today, as you plainly see in the WEG performers and in the Standardbred article the Standardbred can be taken right off the track and retrained for use in all manner of sport with great success. It is a breed with versatile talents, sound and sane and with a tremendous work ethic. I just passed in the manuscript for Standardbred Sport Horses to the publisher, and began this long overdue website revision. Through researching and writing that book I came away with the realization the Standardbred is possibly the greatest genetic sport resource we can access in our breeding programs. This article is a brief look at some of the Standardbred sport bloodlines that are a proven purveyors of Olympic style sport talent. Why would I say that the Standardbred carries the best genes for our type of sport? I found it is absolutely loaded with not only the best Thoroughbred and distance Running Horse bloodlines, but it also has the best of our saddle strains, our jumping traits and even dressage ability in vast amounts. I was truly amazed at what I found. And on top of all that it has the best temperament, and the best feet and legs of all the sport breeds. It is especially valuable for us in the States because it contains bloodlines that are natural genetic bridges to the talented lines in our other sport breeds, giving us the opportunity of building up background power of excellence in our lineages. But there is more. Recently I conducted a extensive study on sound bloodlines and their source in the Standardbred. Inspired by the astounding career of Foiled Again, who before retiring at the end of 2018 amassed 109 wins! I am truly excited about the future for the American breeder of sport horses--we have it all here, and we did not even recognize it! I think because we have had such a long Hunter Horse tradition, right from the earliest colonial times, that we did not really value our stock as something precious, assuming that all breeds and all countries had the same resources. But they don't and didn't. 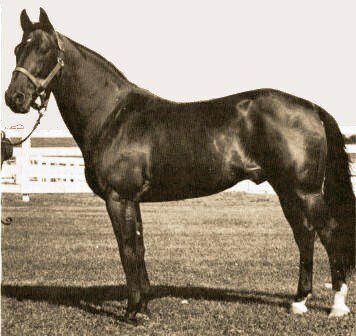 Yes, we got our base stock from Ireland and England--and our breeds are closely related to theirs, but we did not eradicate the original strains, instead we kept all the traits of that wonderful colonial breed intact, while in the British Isles the majority of those pre-Thoroughbred racers were destroyed in their civil wars. As I have said before, that is why we have three racehorse breeds here in the States, not one. But it is way better than that. we have four other pure-bred sport breeds directly descended from that same stock as well: Morgan, Saddlebred, Tennessee Walker and Missouri Fox Trotter, and all seven of our breeds are perfect for crossing with each other because of the common background strains. When you cross our breeds you are reinforcing sport genetics, not farm horse, not coach horse, but unadulterated sport...no other country has this depth and richness in true sport genetics in their gene pool. While I was evaluating all the sport horses that carry Standardbred or are pure-Standardbred I discovered a few things. One is that the bloodlines that succeed in Olympic style sport are the same ones that excel at racing. You might think that those purposes are counterproductive--racing versus jumping or dressage, but they are not. Some are better for jumping of course and others have surfaced as dressage lines. Some of the bloodlines are present in all forms of sport. 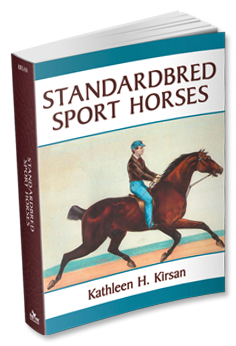 I will go over a few of the main roots here briefly, but I do suggest that for more information on these and other relevant bloodlines you get Standardbred Sport Horses as a reference (available now). Of all the Hambletonian sons I found that George Wilkes AT far exceeds the others in successful sport horse lineages, Electioneer AT comes fairly close, but truly it is George Wilkes AT that fills up the background more than any other. The later line of Peter the Great ST is always there in multiples and more recently Volomite ST 1926 is found continuously no matter the sport expression. Volomite ST, a trotter himself, threw an equal number of trotters and pacers. A line found in multiples in the natural jumpers is Guy Axworthy ST. He is very potent--inbred 3x2 to full brothers: William L AT and Guy Wilkes AT, by George Wilkes AT out of Lady Bunker AT. The beautiful square balanced form is clearly dominant in this line. 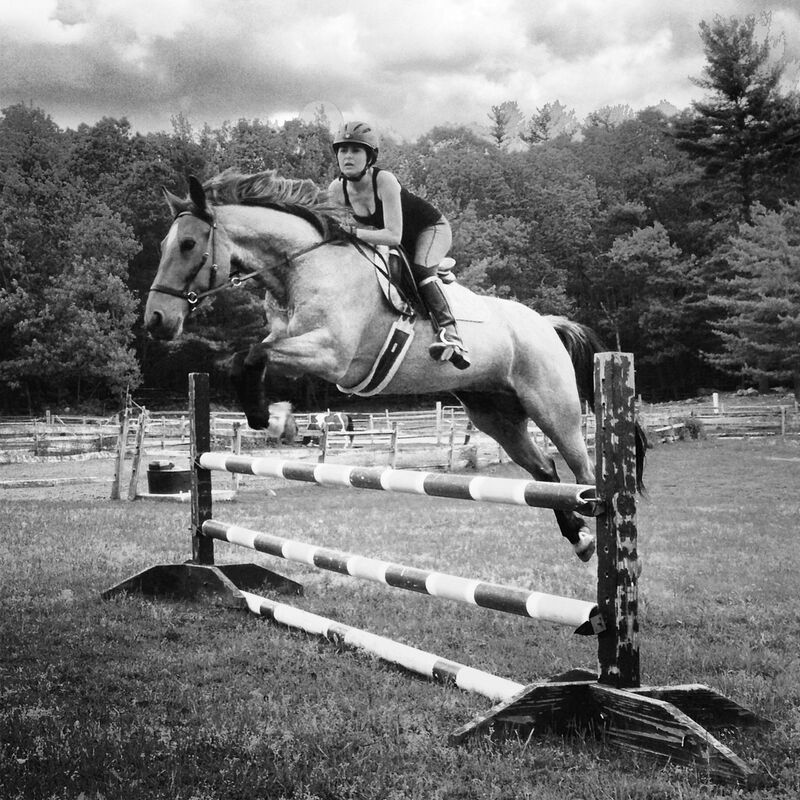 Often combined with multiples of Volomite ST in top jumpers--such as in Merlin pictured at article start. Now here is a surprise: the powerful ability to perform the highly collected trot-based advanced dressage movements of the passage and the piaffe appear to be transferred with dominance in Adios ST, especially when present with his full sister Adieu ST and 7/8 sister Overbid--but they are all free-legged pacers. How can a pacer be a sure transmitter of this ability? I don't know the answer to that, all I can say is this line passes on this talent consistently. Adios ST and his sire Hal Dale ST are found in dominance in top dressage horses such as Whiz Bang ST and Sea the Gray ST who performed beautifully at the World Equestrian Games. Other lines often found in conjunction with Adios ST in the dressage stars are of course Volomite ST and Billy Direct ST. 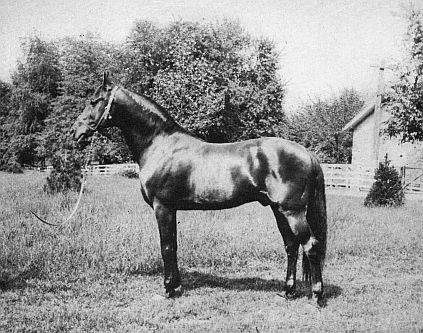 It is interesting that the Hal Dale ST-Adios ST line is inbred to Gibsons Tom Hal RH, and this line is prevalent also in the Tennessee Walkers a breed that also excels in dressage--both gaited and regular dressage. The above are just some brief examples of vibrant sport conduits in the Standardbred, realize there are others. 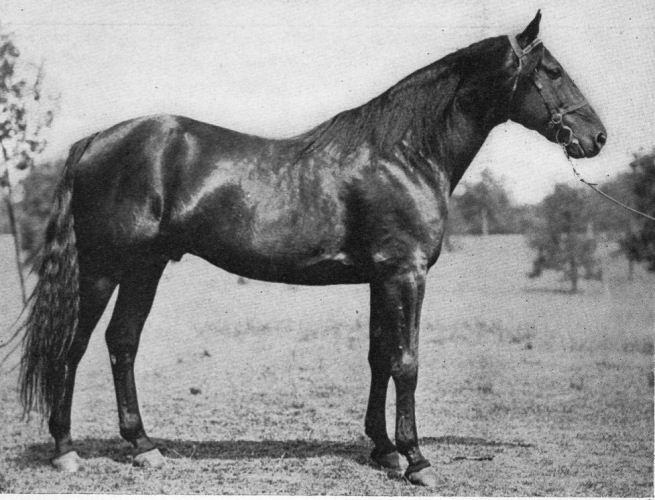 In the modern top sire lines like Speedy Crown ST, Stars Pride ST, Albatross ST and many others, you will find all have powerfully designed pedigree structures, with tight line-breeding and/or inbreeding--see the top modern sire Muscle Hill ST for an example. For the breeder of sport horses this is a bonus, because if you choose to cross with a Standie, you can easily find a bloodline that carries dominance in the traits you are hoping to bring in, plus because of the strong pedigree structure it guarantees you will get the genetics in force. Standardbreds are perfect for crossing with your sport horses that are tightly bred themselves--when brought together you will not just get the transfer of the talents of both parents, but a hybrid vigor factor as well. Some of the greatest performers and producers were bred this way. See Understanding Pedigrees for beneficial pedigree design. Many of you may hesitate to use a Standardbred now because of the newly published theories on the 'gait-keeper' gene. In the rush to promote their testing service, many claims were made. Some of these were not quite accurate concerning our Standardbred and Tennessee Walker, breeds they found to be homozygous for this gene. One of the marketing points for their gene test was that you could tell if your horse was a good candidate for performance and breeding in Olympic style sport by testing it for the gene. Unfortunately, they then published that the possession of the gene was a liability in those sports. They said the horse that carried the gene, especially those homozygous for it, could not perform a balanced three-beat canter. Whether they meant it or not, what they were saying was that our homozygous breeds--Standardbred and Tennessee Walker for instance, could not perform a balanced canter. And it continued on by stating it would not be a good jumper, eventer, racer or dressage horses. Anyone who knows our breeds recognizes how preposterous that statement was, the normal gaits for the entire breed of Tennessee Walker are the running walk and the CANTER and counter canter. Most Standardbreds have a lovely balanced canter as well. And some of the greatest show jumpers and eventers of all time are full or part Standardbred. Naturally, I contacted them, and had the good fortune to find Dr. Lisa Andersson, the scientist who discovered the gene. And we had several conversations via e-mail on the gene and its properties especially concerning the Standardbred. Dr. Andersson proved a true scientist because she was not put off by contrary information, instead she was anxious to hear about our breed and its record at sport. And then she was able to shed light on this issue: Genes do not act alone, and depending on what other traits are present genes can present in different ways. So much so she said a horse or even entire breeds could perform as if they did not have this gene. Also we both concluded that contrary to earlier reports this gene does not necessarily impede the canter or gallop, what it does do without fail is allow top speed at the intermediate gait, and depending on other factors, the horse may also canter and gallop as if it does not carry the gene. Indeed, the Standardbred was regularly shown in walk-trot-canter contests at horse shows into the mid-1900s. That means just as we have experienced first hand with our horses, that most have the ability to canter well. 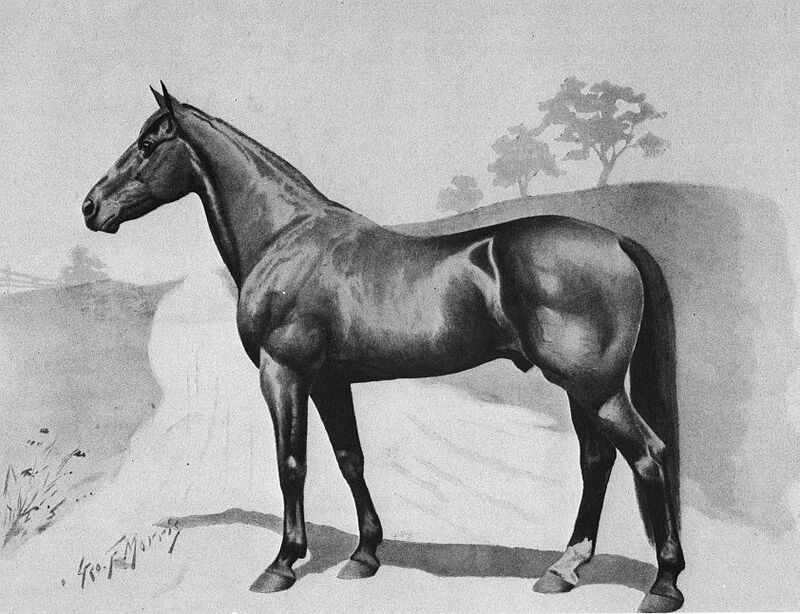 And of course the Standardbred is one of the best sources of jumping talent out there, and has been, even its ancestors, consistently have rated high as Hunter Horses since colonial times right through to today. Concerning DNA studies--for the breeder these are wonderful sources of information explaining long held mysteries in our breeds. But we need to remember the scope of their work is limited by necessity. They must isolate each gene to study it. And sometimes the valuable data that they find, because it is in isolation, does not necessarily give the full picture even of the traits the particular gene represents--such as we just saw in the 'gait-keeper' gene where other factors can and do effect its expression. Does this make their work wrong? No, not at all, but by necessity it is limited and their conclusions are found in some cases in be in error or incomplete. Other scientists later on may be able to shed more light on these traits as they examine other genes that may interact. We must be sensible in reviewing these studies then, be patient as well, and applaud the efforts of our scientists--this is fascinating information. All the DNA studies on the origin of our breeds, the large heart gene, the speed gene and the gait-keeper gene are fully discussed and explained in Standardbred Sport Horses, and how these findings can apply to our own breeding programs. Our American sport breeds carry the largest repository of true sport genetics in the world. Begin to discover what you can accomplish when you breed creatively with the best sport bloodlines. Now available, learn about the real sport bloodlines that abound in the Standardbred, and the true sport horse history of our continent...20% off here.